I read this article and found it very interesting, thought it might be something for you. The article is called Odd-Even Car Restrictions Did Not Improve Delhi Air and is located at https://archive.indiaspend.com/cover-story/odd-even-car-restrictions-did-not-improve-delhi-air-34688. As Delhi’s air quality begins to deteriorate with Diwali, new government data indicates that the Aam Aadmi Party (AAP) government’s restrictions on cars based on odd-even number plates—between January 1-15, 2016, and April 15-30, 2016—did not improve the air quality in the world’s 11th most polluted city. The main reason the odd-even system cannot check air pollution is because no more than 25% of fine, toxic particles are emitted by cars and trucks in winter, according to this 2016 Indian Institute of Technology Kanpur (IIT-K) study, which was commissioned by the Delhi government. The failure of the odd-even system and the data were cited by the National Green Tribunal (NGT) last week, validating similar findings in January 2016 by IndiaSpend‘s network of #Breathe air-quality sensors, which were disputed by the AAP government. Three sources of Delhi air-quality data now confirm that the odd-even system did not lower pollution levels: The union government’s Central Pollution Control Board (CPCB); the Delhi’s government’s Delhi Pollution Control Committee (DPCC); and IndiaSpend’s #Breathe network. Particulate matter, or PM, is the term for particles found in the air, including dust, dirt, soot, smoke, and liquid droplets, classified according to diameter. Particles less than 2.5 µm (micrometres) are called PM2.5, roughly 1/30th the average width of a human hair. Particles between 2.5 to 10 µm in diameter are called PM10. While pollution from vehicles comprises a quarter of the air pollution in winter, as we said, it is less than a tenth in summer—pointing at sources other than private vehicles, according to the IIT-K study. The implied consensus from government-owned air quality devices, independent monitoring networks and IIT-K data is that it is necessary to regulate other sources of pollution—not just in but also around Delhi—instead of just barring odd-numbered vehicles on alternate days. Vehicles rank second in PM 2.5 emissions and fourth in PM 10 emissions. Aside from vehicles, smoke from power plants burning coal and dispersing fly ash, dust from roads and fields surrounding the city, smoke from non-LPG cooking and tandoors (traditional coal-based ovens for cooking meat and bread) in Delhi restaurants contribute to Delhi’s worsening air quality, the IIT-K study found. Air pollution from nitrogen oxides—mainly emitted by power plants, refineries and vehicles—also worsened over the odd-even periods, data from devices maintained by the CPCB and the DPCC show. Road dust is the chief contributor to PM 10 and PM 2.5 pollution, 56% and 38%, respectively. Power plants contribute to 90% of Delhi’s SOx pollution and half the NOx pollution. 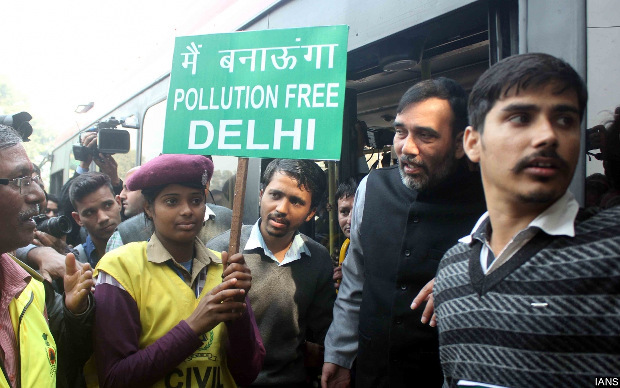 Vehicles occupy the main polluter slot only as regards carbon monoxide in Delhi’s air. The intensity of polluting sources varies according to season. Secondary particles, such as oxides of nitrogen and sulphur pollute the winter ambient air the most. Vehicles also contribute to ambient air pollution in winter, lesser in summer. Vehicles contribute only 6-9% of ambient air pollution from particulate matter in summer. Coal ash, fly ash from power plants, soil and road dust—including the dust from construction activities—affect the summer air the most. During the monsoon—which lasts for roughly three months every year in Delhi—the ambient air quality improves because of high wind speeds and moisture, which gathers particles and wipes the air clean. 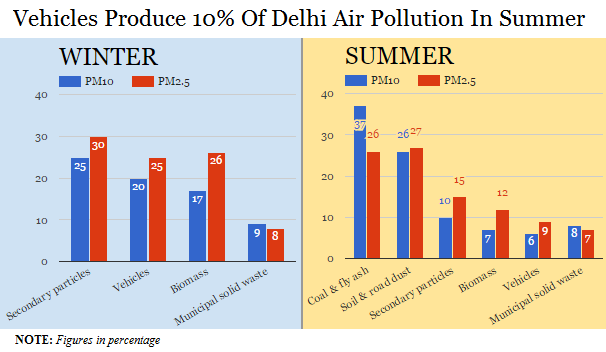 When the monsoon recedes and the October heat makes way for winter, ambient air is affected the most by SOx and NOx (mostly from power plants and refineries), followed by vehicular pollutants. Biomass burning—which pertains to post-monsoon burning of the crop residue—takes place mostly in Punjab and Haryana, but affects Delhi as the third most ambient air-polluting element, as Indiaspend reported in January 2016. As winter passes and summer sets in, ash from burning of coal in power plants, dust from roads and construction activity remain in the air for a longer time and become the worst air pollutants. Air pollution levels in Delhi rose 23% during the second phase of the odd-even registration rule, from April 15 to April 29, over the previous 14 days (April 1 to April 14), IndiaSpend had reported on April 30, 2016. Eight of the11 CPCB sensors showed deterioration in PM concentration (air quality) during the odd-even period. “On a fair analysis of the report submitted by the DPCC, it is clear that the odd-even scheme have not led to any substantial improvement in the ambient air quality of NCT, Delhi,” the NGT order said.